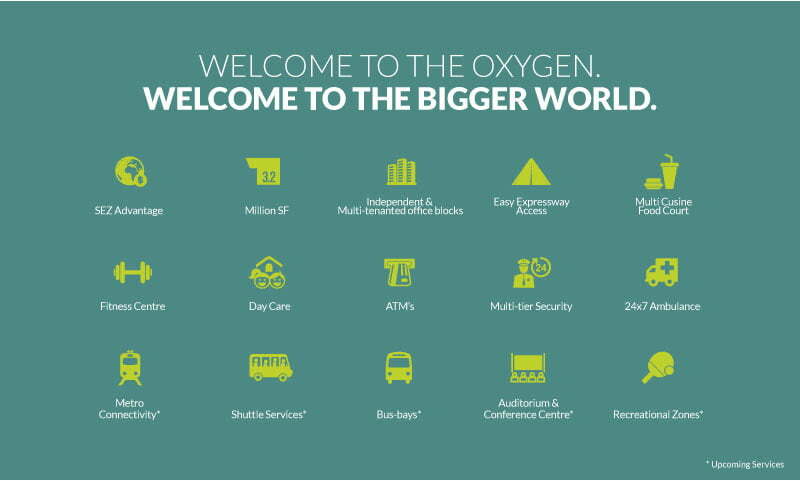 The Oxygen Business Park is a notified IT/ITeS SEZ (Special Economic Zone), Spread across 25 acres & strategically located on Noida Expressway in Sector 144. Pre-Certified LEED Gold Rated developmentMultiphase Development of 3.5 Million SFT· Phase 1 : 1.5 Million SFT of operational campus with 89 % occupancy.· Phase 2: Planned development of 3 towers totalling to 1.8 Million SFT of Grade A IT/ITeS (SEZ). Advanced Security & Safety System· Multi-Tier Security in place.· Segregated Entry plans for private and public vehicles.· Boom Barriers and Guarded checkpoints. · Smart Elevator system segregating office and parking areas. United Health Group, Dell, EXL, Sapient, Global Logic etc. · 5 mins from upcoming Metro Station. · FNG Expressway < 1 KMS. 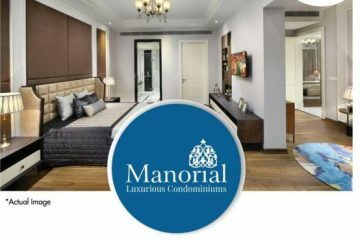 · Just off prime Noida Expressway. · Signal free access from Delhi. · Upcoming residential infrastructure in the vicinity. 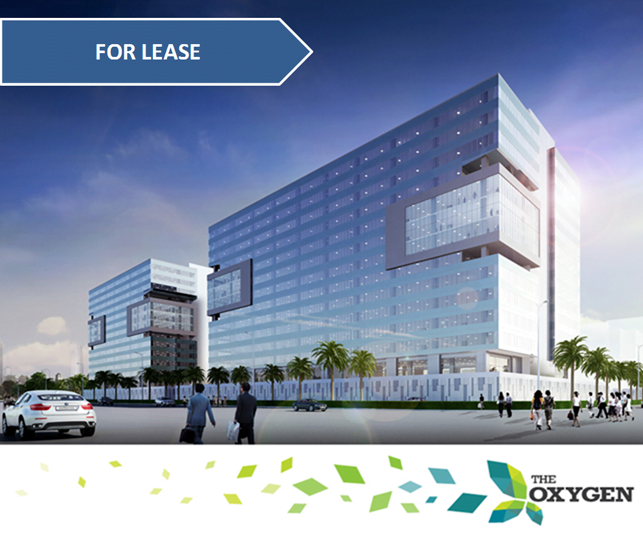 Phase 2 of Oxygen Business Park will be home to 3 Independent office towers totaling a development of 1.8 million SFT of Grade-A IT/ITeS SEZ space. 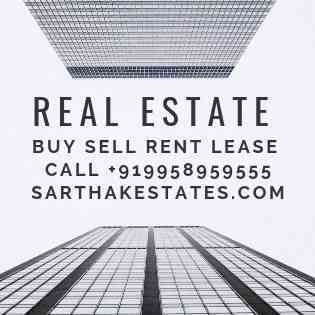 · 3 Independent Office Towers each spread over Ground + 13 Floors with floor plates ranging from 33,000 SFT to 55,000 SFT. The 3 office towers would offer state of the art design with efficient floor plates which would offer immense flexibility for any client to grow multi-fold in the campus. · Transport Hub: Dedicated on campus bus shelter which would serve as the focal point for the Park. 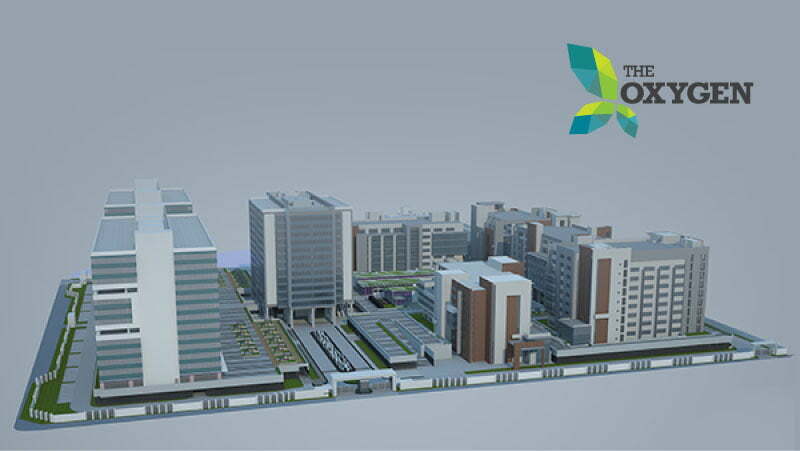 3 World Class Amenities block which would have Fitness Centre, prominent F&B Brands and 1500 pax food court. · Auditorium and Conferencing Facilities.